Engineers have developed a tiny robotic capsule that injects insulin once it lands in the stomach. Here was the challenge for bioengineers: Find a way to for patients to take drugs — like insulin or monoclonal antibodies used to treat cancers and other diseases — without injections. The medicines are made of molecules too big to be absorbed through the stomach or intestines; in any event, the drugs would be quickly degraded by the body’s harsh digestive system. Now, a team of scientists may have found a solution that delivers these drugs in a capsule a person can swallow. Their inspiration? A tortoise that always rights itself after rolling over. The device works in rats and pigs, the investigators reported on Thursday in the journal Science. The researchers — at M.I.T., Harvard and Novo Nordisk, the pharmaceutical company — hope to start testing Soma in humans in three years. Outside experts said the device may well be a viable solution to the injection problem. “It’s a very new concept and a really cool idea,” said Edith Mathiowitz, a professor of medical science and engineering at Brown University. While sounding like something out of science fiction, Soma synthesizes a number of recent engineering advances, experts said. “What they have done is taken ideas from many areas and integrated them,” said Tejal Desai, chair of bioengineering and therapeutic sciences at the University of California, San Francisco. The researchers knew that if they could get a drug through the wall of the stomach, the medicine would enter the bloodstream. Because the stomach does not have many pain receptors, a prick from the tiny post would not even be felt. Creating a device to accomplish this required three key advances, said Dr. Giovanni Traverso, a gastroenterologist at Harvard’s Brigham and Women’s Hospital in Boston and a lead author of the paper. The first challenge was to make a device that would land on the stomach in a predictable way. For ideas, the researchers looked to nature — and discovered the leopard tortoise. An angled shell helps the tortoise roll back onto its feet no matter which way it falls. The engineers decided to imitate the tortoise’s shape with a tiny device that would always land on the wall of the stomach, in the right orientation, no matter how it tumbled down the esophagus. The pill’s shape was inspired by the leopard tortoise. Its shell helps the tortoise right itself if it gets tipped over. The pill’s shape was inspired by the leopard tortoise. Its shell helps the tortoise right itself if it gets tipped over. Next, they needed a cue that would trigger the release of a tiny post made of insulin that they would put in the device. That sort of environment will dissolve sugar, as a lozenge or candy dissolves in your mouth. The insulin needle was compressed like a spring and held in place with a thin disc of sugar. By controlling the size of the disc, the researchers were able to control how long the mechanism would stay intact. They decided on five minutes: When the sugar dissolved, the insulin post would pop out. Finally, they had to make that tiny insulin post. The device that would hold it is small, the size of a pea, which restricted how much drug it could contain. By experimenting with dried insulin, compressed under different pressures, the group discovered a way to make little insulin posts that were stable enough and composed of enough insulin to do the job. 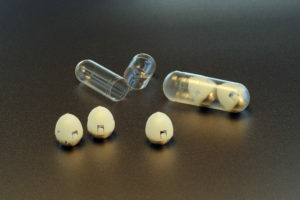 As it’s conceived now, a patient swallows a capsule containing the device, said Robert Langer, a chemical engineer at M.I.T. The capsule dissolves in ten minutes, and the device lands on the stomach wall. The sugar disc shatters five minutes later, releasing the post. It pokes through the stomach wall, delivering insulin to the bloodstream. Eventually, the device is excreted; patients should not even notice it. In tests with pigs and rats, led by Alex Abramson, a doctoral student at M.I.T., the device delivered as much insulin as a conventional injection. But the stomach had to be empty when the animals swallowed the capsules. Much work remains — more tests for safety and to make sure that frequent injections do not damage the stomach, for example. But the hope is that the device would be used for an array of injected drugs, not just for insulin. “Insulin is a proof of concept,” Dr. Langer said.